A 1930 Duesenberg Model J Dual-Cowl Phaeton sold for $2,090,000 as the top result at the RM Sotheby’s Hershey 2016 sale. This Duesenberg was the only car that achieved over a million dollar but several further vehicles also exceeded expectations. The garage-find 1957 Porsche 356 Speedster sold for $341,000 while David Holls Lincoln Boattail Speedster achieved $605,000 – more than double the highest pre-auction estimate. RM Sotheby’s held its 10th anniversary Hershey classic car auction on October 6 & 7, 2016 at Hershey Lodge, Pennsylvania, USA. RM Sotheby’s earned $11.58 million from the 132 lots on offer. The sell-through rate was 90%. A surprise was only $825,000 for a 1957 Mercedes-Benz 300 SL Roadster. Although 300 SL prices have been weaker in the past year, it is very rare for these models to sell for below a million. The pre-auction estimate was $900,000 – $1,100,000. The top result at the RM Sotheby’s Hershey 2016 sale was $ 2,090,000 for a 1930 Duesenberg Model J Dual-Cowl Phaeton. This is one only three ever produced and was offered from more than half a century of single-family ownership. 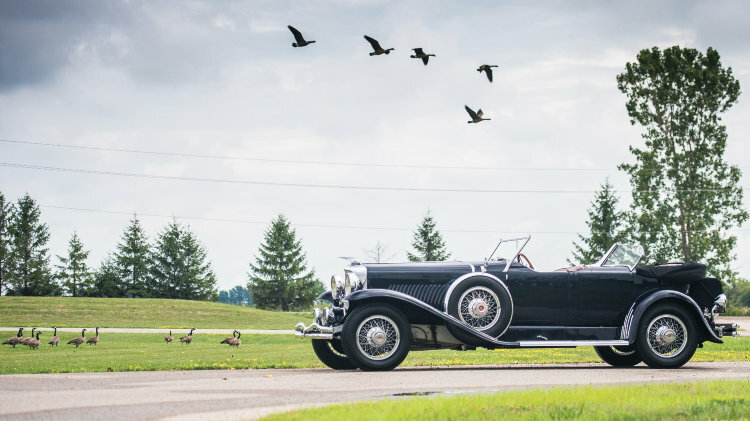 In a catalogue highlighted by a delightful series of cars coming out of long-term ownership, a 1930 Duesenberg Model J Dual-Cowl Phaeton was the star attraction of the two-evening sale. One of only three original Murphy Dual-Cowl Phaetons, the Duesenberg was retrieved from storage at the Mexico City airport in 1962, and offered from 54 years in single-family ownership at RM’s Hershey sale. Hotly contested by bidders in the room and on the phones, the Model J realized a strong $2,090,000. See also: the Duesenbergs Pre-Auction Press Release for more on this beautiful car. Looking back over the two-evening event, Thursday’s sale session was headlined by the spectacular 1932 Lincoln Model KB Boattail Speedster. Designed by legendary General Motors stylist, David Holls—earning its nickname, the ‘David Holls Speedster’—the exquisite car represented the Lincoln that ‘never was’. Attracting plenty of admirers during the sale preview, it was the subject of a 10-minute bidding contest, shattering its pre-sale estimate of $200/275,000 at a final $605,000. Friday’s session was headlined by the top-selling Model J Duesenberg, highlighted above. Other standout attractions from the second evening were a meticulously restored 1935 Auburn Eight Supercharged Speedster, a two-time 100-point car in 2016 Classic Car Club of America judging, for $880,000; the sole-surviving 1931 Pierce-Arrow Model 41 LeBaron Convertible Victoria, which sold well at $456,500; and, an exceptionally restored 1958 Chevrolet Impala Convertible, which exceeded expectations, selling for $161,700 against a pre-sale estimate of $100/125,000. Among additional highlights and perfectly emblematic of the unique finds at Hershey, a 1925 White Model 15-45, commissioned in period as a Yellowstone Park tour bus, nearly doubled its estimate, realizing $88,000. In contrast to recent years, RM Sotheby’s will round out its 2016 calendar not with a New York sale but rather a spectacular sale in Italy. No fewer than 800 lots will be offer at the Duemila Ruote (2000 Wheels) in Milan, Italy, November 25-27. Coinciding with the Milano AutoClassica Classic Car Show, the eclectic offering will feature more than 800 lots, making it the largest, automotive-themed private collection sale ever staged in Europe. With some 430 cars, 150 motorcycles, 60 boats and hundreds of bicycles and automobilia all offered without reserve, collectors will be truly spoilt for choice.